Have you ever imagined what it's like to live in an upside down world? Wouldn't it be fun and exciting? So when I received an invitation from Upside Down World Cebu, I honestly screamed with excited and eagerly typed YES in my email response. I have always been curious with modern art museums and being offered the opportunity, I just couldn't say no. It was one Saturday afternoon when we paid Upside Down World Cebu a visit and it was a visit we will never forget. Upside Down World Cebu is located at the second floor of City Time Square Phase 2 and can easily be spotted when you're coming from the front entrance of City Time Square. Upon arriving, we headed to their reception area for our tickets. Then we kept our things and shoes in their lockers. Before going in to the theme rooms, they strictly require to take your footwear off and come in with socks on or barefoot only. There will also be one staff assigned per group. The staff will be the one to take your photos and even give you ideas on how to pose in each room. They have a total of 11 themed-rooms and it's up to your wild and creative imagination on how you can create cool photos out of them. I won't be talking too much on this post because I'll let our photos do the talking. Enjoy! Thinking of ways to beat this man! Hey there, buddy! Wanna be a chef someday? Dear, why are you stopping me from getting food?! G-R-R-R! Learn how to wash your own clothes, buddy. Ewwww! Why are you diving in to the toilet? 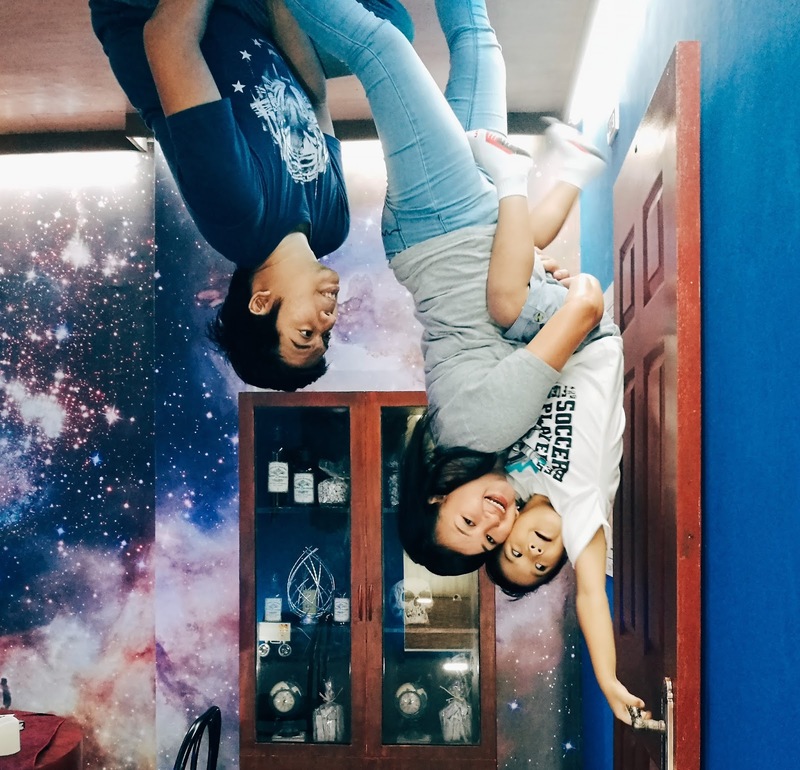 This is not an upside-down photo but we just can't help but take advantage of the galaxy background! Lol. Haha it is! Super fun! Lingawa ani nga experience Janine! Nice kaayo murag baligtad jud kaayo hehehe.